A Year of FHE: Best of General Conference // Four Essential Steps that can Help Us Come to Know the Lord + a FREEBIE! Best of General Conference // Four Essential Steps that can Help Us Come to Know the Lord + a FREEBIE! I think we ALL want to increase our closeness to our Savior. His is true friendship, loving charity, grace, and sanctifying power. I really loved this talk when I was listening to it during this most recent conference and I am excited to share a small portion of it and a FREE printable that goes along with it! Watch it below. A grand objective of mortality is not merely learning about the Only Begotten of the Father but also striving to know Him. Four essential steps that can help us come to know the Lord are exercising faith in Him, following Him, serving Him, and believing Him. 01. Exercising Faith in Him We become acquainted with Him and His voice as we study and feast upon His word in the scriptures, pray to the Father in His name with real intent, and seek for the constant companionship of the Holy Ghost. Learning and applying in our lives the doctrine of Christ is a prerequisite to receiving the gift of faith in Him. 02. Following Him The Savior has admonished us to become as He is. Thus, following the Lord includes emulating Him. We continue to come to know the Lord as we seek through the power of His Atonement to become like Him. 04. Believing Him Believing Him is trusting that His bounteous blessings are available and applicable in our individual lives and families. Believing Him with our whole soul comes as we press forward along the covenant pathway, surrender our will to His, and submit to His priorities and timing for us. Believing Him—accepting as true His power and promises—invites perspective, peace, and joy into our lives. We come to know the Lord as we not only believe in Him but also believe Him and His assurances. I made a pdf file that has 5 bookmarks to a page so you can easily print enough for a lesson handout or to deliver to those you Home Teach or Visit Teach. 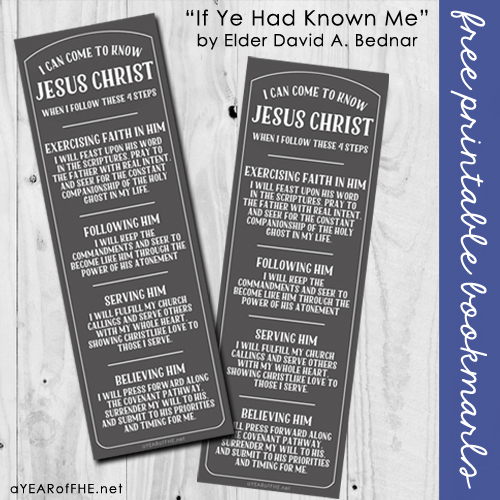 Each bookmark features 4 statements to help the reader commit to developing a deeper relationship with the Savior. Labels: Best of General Conf. I love this bookmark! Thanks for sharing!! These are great! Thanks for sharing your talent! USING THIS SUNDAY! THANKS FOR SHARING!! Thank you! Printing them for today!